The Sandcastle Trust have teamed up with the Weather Lottery to give you the opportunity to win prizes and raise funds to help us provide much needed fun and respite to families affected by a rare genetic condition. When you sign up you’ll receive a unique six-digit lucky number for each entry you take. Each entry costs £1 – of which The Sandcastle Trust will receive a minimum of 37p. 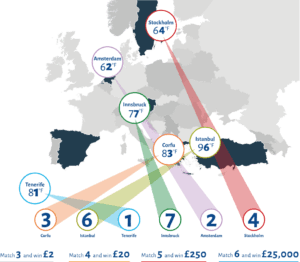 The Weather Lottery result is based on the last digit of the Fahrenheit temperature from 6 popular European destinations. The draw is made every Monday. To win a prize you must match at least three numbers in the right order. Your prize-winning cheque will be sent in the post to you. There’s no need to claim your prize. Check if you’re a winner! The results will be published on the Weather Lottery’s Twitter account, and Facebook page or you can see if you are a winner by entering your lucky number into the Result’s Checker. The quickest way is to use the online form here. Alternatively, if you would prefer to complete a form by hand, please email info@sandcastletrust.org and we will send you a hard copy of the form. This Weather Lottery is administered by Prize Provision Service Ltd who are licensed by the Gambling Commission as an External Lottery Manager. For full terms and conditions click here.